I got an AWIC (air to water intercooler) kit from Very Cool Parts a while back, and I have now started installing it. 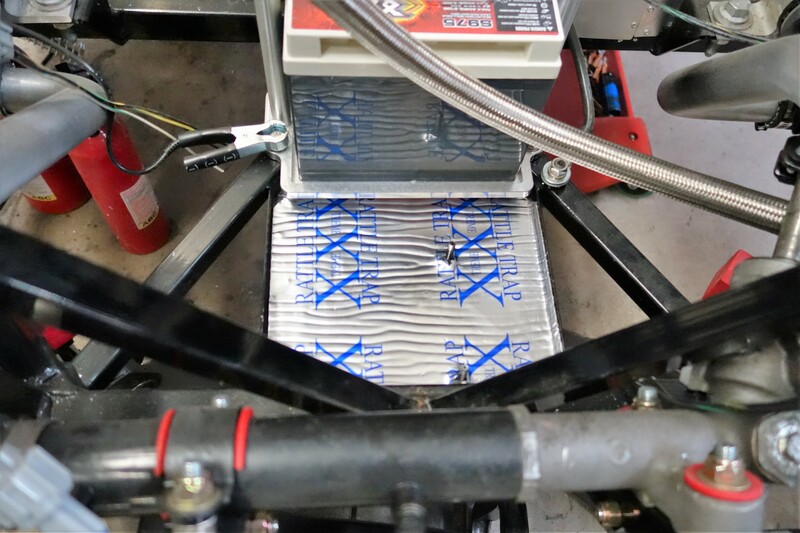 I mounted the heat exchanger in front of the radiator using Heat Exchanger Mounting Brackets from Zero Decibel Motorsports. 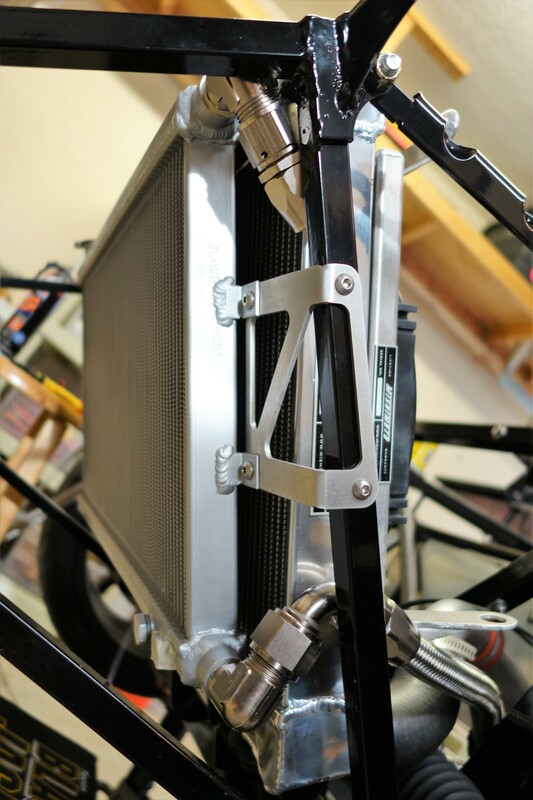 The brackets made quick work of getting the heat exchanger mounted. Just a few holes drilled, rivnuts installed, and it was done. I tried a few different locations before deciding to mount the coolant pump down on the battery tray. That seemed like the best place to keep the hoses under control and have the pump out of the way. Since the battery tray is part of the underside of the car, I did not want bolt heads protruding underneath. I decided to weld a pair of bolts to the topside of the tray to which I would mount the pump bracket. I also installed some Rattle Trap sound deadening as I have on many sheet surfaces. I installed the pump and bracket to the mounts and ran the hose from pump to the heat exchanger. The hose AN -12 stainless braided and is attached to the pump with a hose clamp. 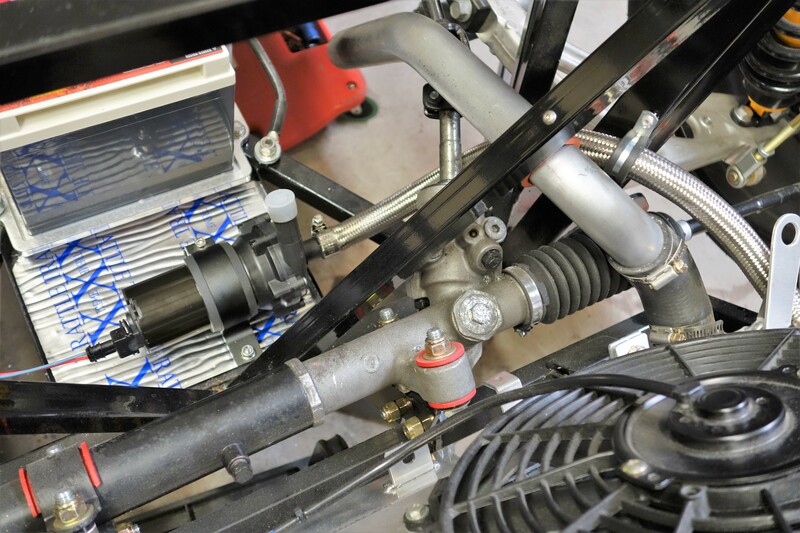 The hose is plumbed to the heat exchanger with some 90 degrees AN fittings from Russell in the Endura finish. I have to wait until the engine is assembled and installed before I can run the rest of the AWIC plumbing. More to come soon!